I am in the remote reaches of Wisconsin, enjoying an extended holiday with precious little access to technology. The snowmobiles are humming and the sleds are perched on powdery precipices of midwinter. I’ll be back among the digital in no time with new posts, but in the meantime, I wish you all a happy New Year. When art is so ingrained in our collective conscious that its removal would throw into question our basic understanding of the world around us, it is easy to overlook what made it ubiquitous in the first place. We take its brilliance for granted or fail to see the ingenuity in what we now consider commonplace. Having just seen the Milwaukee Repertory Theatre’s spectacular 2013 rendition of A Christmas Carol this weekend, I was reminded how embedded this 170-year-old story is in the fabric of our holiday traditions. The adaptations on film are countless, with casts featuring men, Muppets and Mickey Mouse alike. The concise novella is so perfectly suited for stage that it can be found in playhouses throughout the country each December. What made it so? Certainly, it struck a chord with citizens of Victoria-era Britain who lamented how industry and greed had sullied the revelry and the spirit of Christmas in its time. Its longevity has root in how timelessly translatable the tale remains. Basic lessons of human decency, thankfulness and charity are appropriate for any era. Despite these qualities, the small book might easily have been discarded with the shredded gift wrap as a preachy primer on the Golden Rule. In my mind, the storytelling convention that sets A Christmas Carol apart is Dickens’ portrayal of a redeemable villain. And Scrooge is not just any villain; he is the story’s main character. Dickens transforms a completely unsympathetic wretch into a hero, and he does so in fewer pages than constitute the chapters of some books. Yet, it is through this hyperbolic lens that we relate to Scrooge, not in full, but in hints and whispers of our own imperfection. 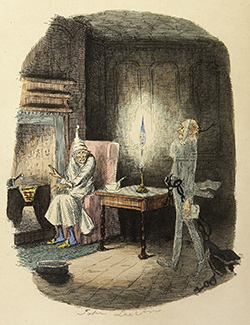 Dickens forces us to see ourselves in Scrooge. It’s not that Scrooge is particularly likable, even as we see his sad history unfold before us. But we come to empathize because we see elements of ourselves; ghosts of our ambition and pride, and, as the story personifies, Ignorance and Want. Our relationship with the main character’s plight is the signature element that makes this story so compelling. We need Scrooge to be saved so that we may consider ourselves worthy of salvation. For Ebenezer, it’s a 180-degree shift. For the rest of us, with fewer proclivities toward malevolence and parsimony, change doesn’t seem quite so daunting by comparison. That is why Dickens’ Carol continues and will continue to be a integral part of our holiday celebrations and storytelling traditions. 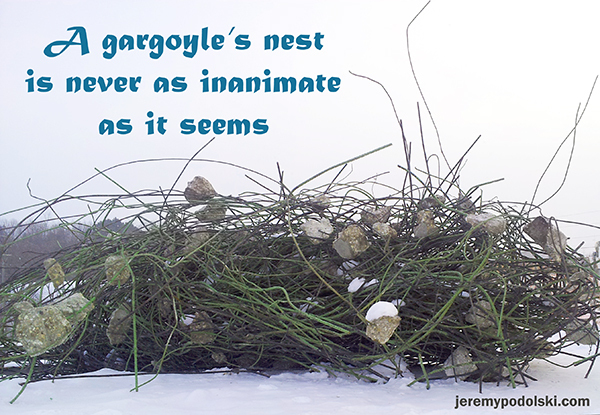 For if the villainous Scrooge may earn reclamation, surely it is within our grasp. 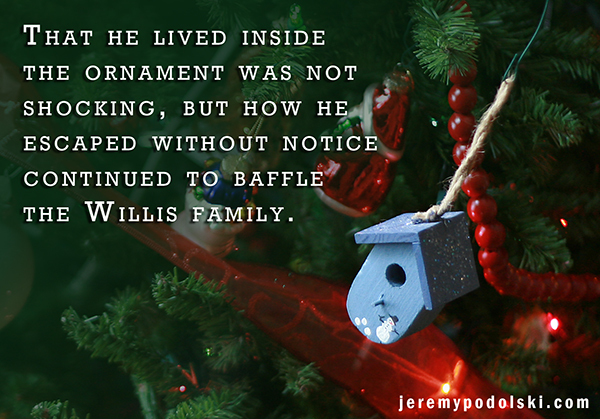 Who else has been blogging about A Christmas Carol recently? * And if you live anywhere near southeast Wisconsin, go see the Milwaukee Rep’s version of A Christmas Carol at the Pabst Theatre. This is a group that truly knows how to keep Christmas well. I’ve always embraced the belief that knowledge should be shared. Access to knowledge is requisite for our enlightenment as individuals and our advancement as a society. An ivory tower is about as beneficial as a silk paperweight. I think my admiration for libraries is rooted in this notion. It really should be a source of national pride that Americans decided long ago that books are a resource so important that they must be made widely available to all people at no direct cost. Here, the written works of authors comprising every genre under the sun co-mingle and wait for an equally diverse clientele of community members to choose their next intellectual treat. What other product or service do we treat quite like books? What other item in this world can one borrow from a nearly limitless supply with no obligation other than the promise to return it in three weeks time? The concept is a vestige of classic values, all the more valuable for its rarity. A trip to the library is a family activity: academics, culture, entertainment and togetherness wrapped in one paperback package. I usually can’t escape our local library without the use of a bag or wheelbarrow for my kids’ selections, and that’s after reading two or three books right on the spot. You can’t manufacture that kind of enthusiasm, but you can cultivate it among children and adults. It also helps to have a bit of whimsy, which was my immediate thought the first time I saw a Little Free Library®. Book exchanges and hand-me-down copies are nothing new, but something about that over-sized birdhouse of a library struck a chord. And once you notice one of them, you can’t help but spot them everywhere. A Little Free Library® outside of a school in Greendale, Wis. They carry an element of surprise. You never know what a given library will offer on a given day. It’s an ever-changing inventory sustained by generosity and caring for the common good. And no two libraries ever seem to look the same. There is also some home-state pride here. 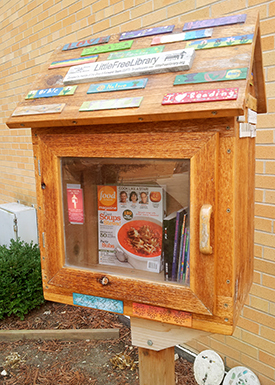 Free Little Library® originated in Wisconsin through the creativity of Todd Bol of Hudson and Rick Brooks of Madison and has grown dramatically in four years. You can read their story at littlefreelibrary.org. Most striking to me is their world map, which shows every registered Little Free Library® location. They blanket the country and have almost limitless capacity for growth. Just a few blocks from where my family owned our very first house, in Milwaukee, Wis., a woman has a Little Free Library® in her front yard. HER FRONT YARD. In an era where people tend to be more open with strangers online than with live humans sharing the same sidewalk, this is a wonderful throwback to a simpler era. An open invitation to visit. A small touch that makes a row of houses feel like a neighborhood. A neighborhood like a community. I love that there also is a Little Free Library® right outside the front door of my children’s school. I pass it most days and can’t help but peek at what’s inside. I wonder about who will be next to pick and book, and what stories they may have to tell. Which reminds me, I think I have a few books to share.